Macro-beauty is easy to see: Hiking a trail through Ebey’s Landing National Historical Reserve, you can easily take in the sweeping vistas and epic landscapes. Yet it’s easy to miss the micro-beauty: The Nootka rose and nodding onions escape notice. Natural and invasive plants line the hiking trails and hillsides, but they’re rarely fully seen. Not everyone overlooks the native flora, though. Artist Deborah Montgomerie sees what others often miss. She goes beyond just looking at the world to really focus on the intricate details, down to the smallest seed. She then shares her study with the world through her art. Montgomerie is a contemporary botanical artist. 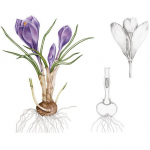 As a member of the American Society of Botanical Artists, she uses her skill, along with scientific accuracy, to display plant life in great detail and beauty. 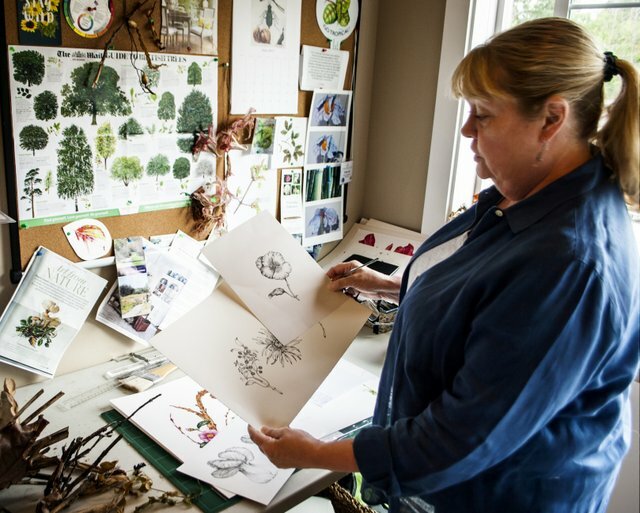 Through the use of graphite, ink, and watercolor paints, the plants of Whidbey come to life on her paper. 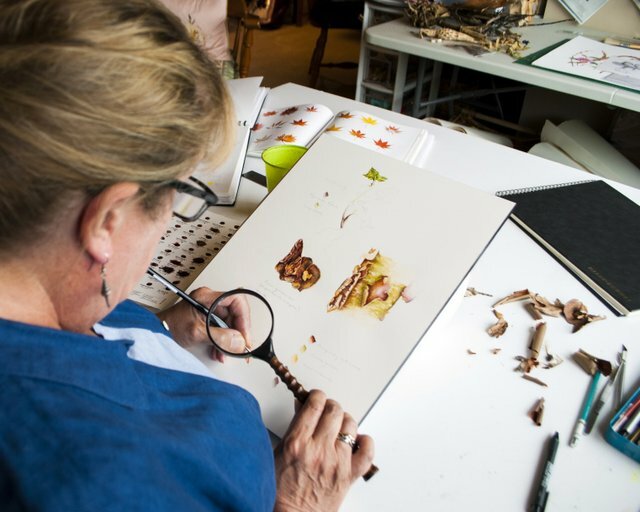 Montgomerie officially entered the world of botanicals in 2015 when she graduated from a distance learning course with the Society of Botanical Artists in the UK. 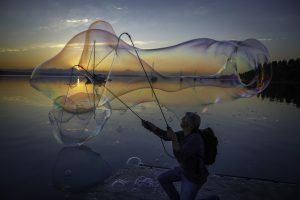 Yet, her art career began much earlier in her work as an aerospace industry technical illustrator and graphic designer. She originally trained in textile design. For those inclined to enjoy and purchase her artwork, there are a number of opportunities. 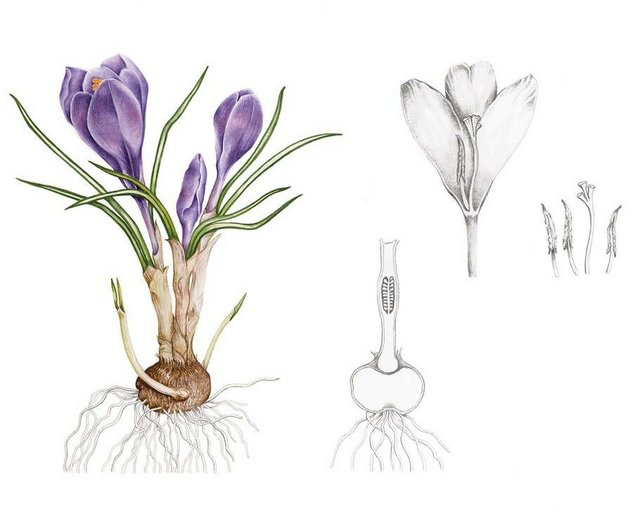 “Examples of my work can be seen on the American Society of Botanical Artists website,” she says, “And I sell a line of botanical cards at the Bayview Farm and Garden store.” An opportunity to meet Montgomerie and view her work personally is coming during the summer Whidbey Working Artists Tour on August 26 and 27. 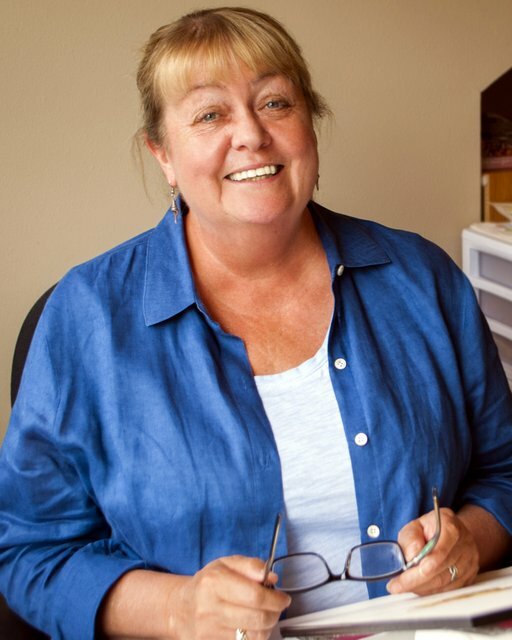 She, like many other Whidbey artists, will be opening her studio to the public. Like artists around the world, Montgomerie’s art is fueled by passion and the need to create. 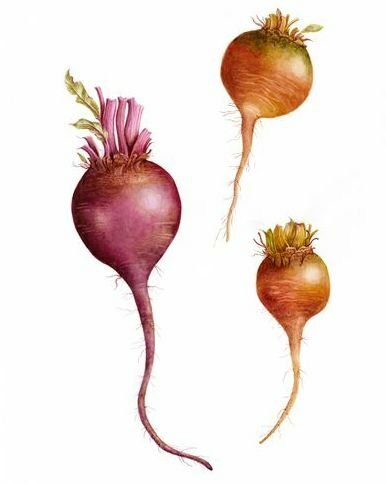 “I am crazy about portraying fruit and vegetables, but I also have a passion for depicting subjects that have character, such as seeds, pods, roots etc. I love to haunt the island farmers’ markets looking for any unusual heirloom veggies,” she says. Montgomerie’s latest work takes her to Ebey’s Landing. “I often go there to study plants. It’s a unique, magical place that I never get tired of visiting. I like to draw attention to the plants that everyone walks by, so they will appreciate them. I intend to produce a book of my sketchbook studies showing color swatches, measurements, and other details that I hope will be of interest to artists, hikers, botanists and scientists alike.” Montgomerie also plans to expand beyond botanicals to include more items from her nature collections, including feathers, insects, and beach finds. As sunlight glides in through the large, second-story window of her studio, Montgomerie’s steady hands control the most precise of brush strokes as she portrays a local tree. One look at the delicate majesty of her flawless pears, proud flowers, and root systems shows the inner love that guides her skilled hands. Through her art, Deborah Montgomerie helps us truly see.